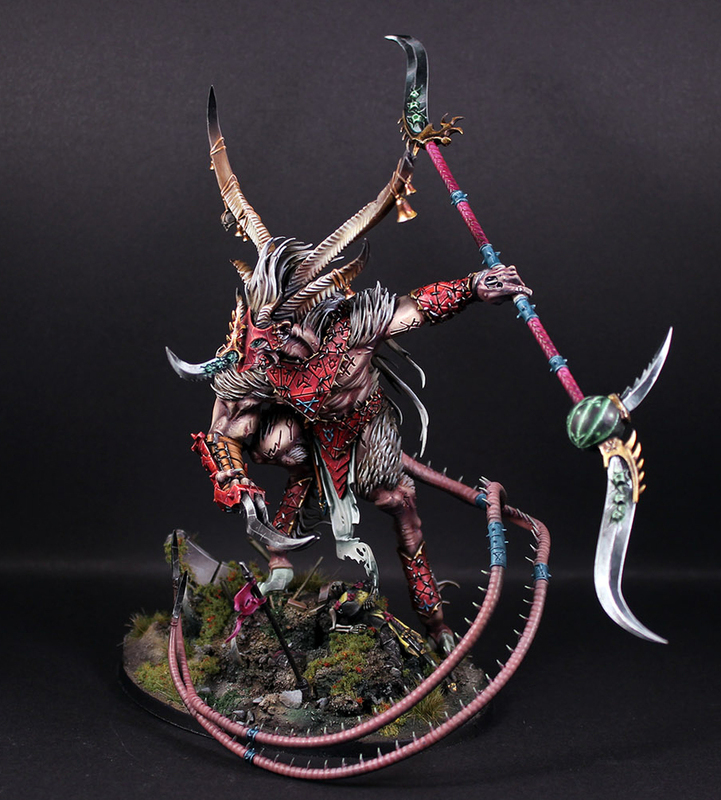 This is definitely the best looking Vermin Lord I have seen since the new plastic kit came out. Pretty much every professional level paint job I have seen for it have relied way too heavily on airbrush techniques. For me an airbrush is a tool to help you attain an end result similar to this, you don't want it to look like it was painted with an airbrush. That always ends up looking way too soft and undefined. This guy though looks like he was painted completely by hand. There is some subtle conversion work on the Vermin Lord, mostly just reposing. The pose looks very natural and menacing. This must have involved at least two Vermin Lord kits since in the stock model one end of the halberd is buried in the ground. The painting is great and is very similar to the 'Eavy Metal style. The skin stands out as particularly well done, since this is the area that seems to fall apart the most on other people's renditions of the mini. I also really like the metals. It looks like true metallics, but painted in a style more associated with non-metallic metals. This is something I have tried to achieve myself on my own Fantasy Chaos Lord, so I can attest that it takes a long time to do. The battle damage on the bright red armor is a nice final touch. I have to say, in my opinion, this model looks a lot better on an oval base like he has done here. Well painted models that are this large are even more impressive to me since all of your transitions have to be even smoother than normal since they are so much more apparent. Age of Sigmar Painting Competition Winners! Age of Sigmar Painting Competition Update!